When Ethan checks under the bed for his monster, he finds this note instead: “So long, kid. Gotta go. Someone needs me more than you do. –Gabe” Ethan knows that the ‘someone’ must be his little sister Emma, who keeps climbing out of bed to play. She obviously needs a monster to help her get to sleep, but not HIS monster! Will Ethan lose Gabe forever? 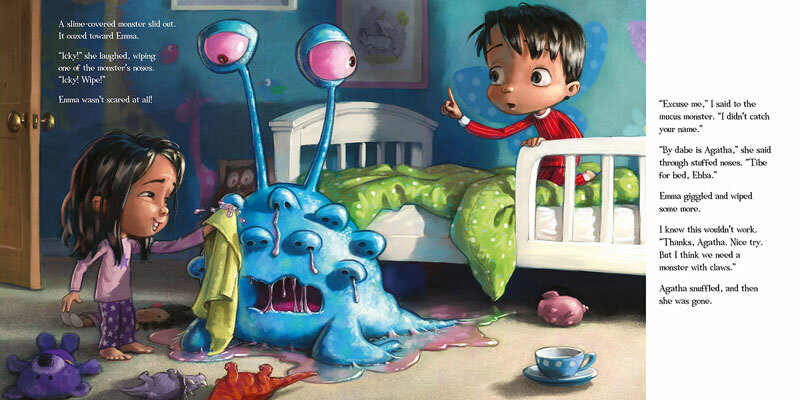 Hey, That’s MY Monster!, companion to the best-selling I Need My Monster, is an irresistible monster-under-the-bed story for all monster-loving kids. The perfect balance of giggles and shivers will keep you under your covers, and you’ll soon be sleeping soundly. Another round of under-the-bed-boojum auditions from the creators of I Need My Monster (2009). Outraged that his personal bed monster, Gabe, has decamped to attend to his wakeful little sister, a lad marches across the hall to remonstrate. Given three chances to conjure up a suitable new monster for hyperactive Emma, three drippy, wormy, tentacled horrors are summoned in turn. Unfortunately, Emma turns out to be delighted rather than properly terrified, and none will do. Will the boy be forced to go monsterless? Drawn with big, shiny eyes and oversized heads, the two light-skinned sibs glow with energy—but the garishly hued monsters in McWilliam’s toy-strewn bedroom scenes are show stealers, whether exuding pools of pink slime or rearing up in glowering, warty menace in vain efforts to get Emma into bed. At last, in a satisfying if not particularly logical twist, it turns out that Gabe himself has a little sister, Stella, whose threatened attack on the giggling Emma’s toes results in a quick bonding and, a page turn later, snoozing children on both sides of the hall. What could be more soporific at bedtime than hairy, green-haired slime ogres with nightlight-orange eyes? … charmingly crafted and original story wonderfully supported by … truly impressive artwork….Unreservedly recommended for children ages 5 to 7, Hey, That’s MY Monster! will prove to be an enduringly popular addition for family, elementary school, and community library picture book collections. Ethan, previously seen in 2009’s I Need My Monster, relies on Gabe, the monster under his bed, to keep him in bed where he belongs. After Gabe plans to migrate across the hall to scare Ethan’s younger sister, Emma, into staying in bed, Ethan helps Emma summon alternative monsters so that he can keep Gabe. 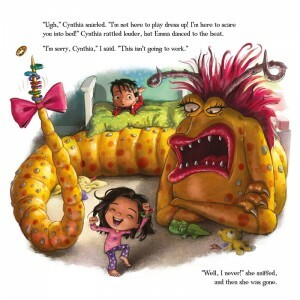 Emma is cut from the same cloth as Boo from Monsters Inc.—she’s tickled, not terrified, by the visiting monsters—and McWilliam’s cinematic artwork embraces the comedy of the situation as Emma puts bracelets on the snakelike tail of one monster and jumps rope with the tentacles of another. It’s an entertaining reminder that a little fear can be fun. Most kids would panic at the thought of a monster lurking underneath their bed, but not Ethan. He’s desperate to get his back. 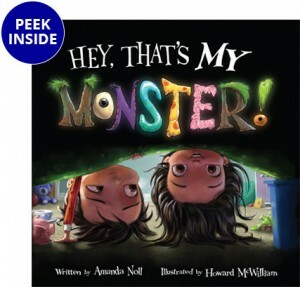 Hey, That’s My Monster!, from Amanda Noll, is a quirky bedtime story with plenty of good humor, thrills, and sibling exasperation. Bold and colorful, the illustrations by Howard McWilliam are reminiscent of Monsters, Inc., with their large, expressive eyes, gleeful movement, and hideously charming monsters. Spot-on interactions and conversations between Ethan and his sister Emma, an active, sleep-resistant toddler, will resonate with families everywhere. So whether little sister is a sweetheart, a monster, or maybe a bit of both, bedtime has never been so entertaining. 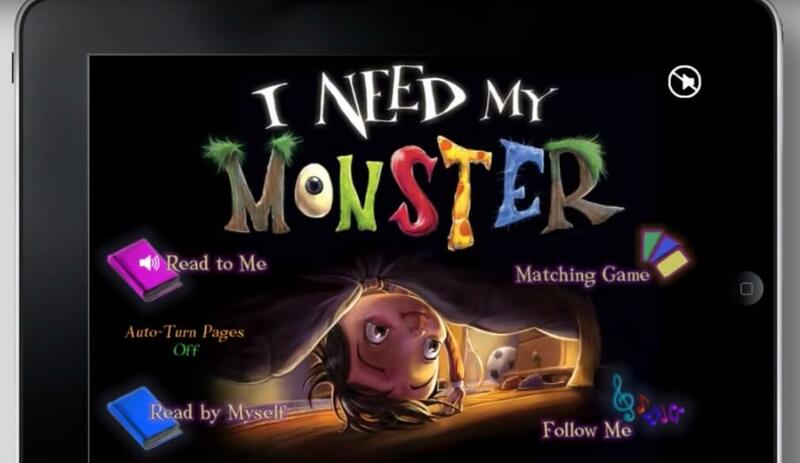 “The follow-up to I Need My Monster by the same author and artist. Ethan’s monster, Gabe, has disappeared from his place under the bed and Ethan desperately needs his monster to help him sleep at night. But Ethan’s little sister refuses to go to bed, so the monster has gone where he’s needed. Clearly, little sis needs a monster of her own to keep her in bed and Ethan must have his monster back. Can Ethan find another monster and convince Gabe to return? Seriously cute (and kind of disgusting). Another absolute delight. Delightful pencil and digital illustrations are the highlight of this sequel to I Need My Monster. Sure, now Ethan has his own monster under the bed, but his sister is in dire need of the same. She’s always out of bed and bopping around the house when she should be asleep. A monster under her bed would take care of that. However, though many candidates apply she is frightened by none of them. Is Ethan going to lose his own monster to his sister’s needs? Wait, his monster has a kid sister, too. Maybe things are going to work out after all. There’s a feel of “Monsters, Inc.” here, so this is a tad derivative. Nevertheless the story is fun and the vivid three-dimensional illustrations are truly amazing. This will not be a shelf-sitter. My Thoughts as a Writer: I enjoyed the fun concept of turning around the typical monster-under-the-bed story by including a problem that the narrator’s sister isn’t afraid of monsters. I liked the inventive monsters with their different ways of attempting to get Emma to sleep. The rich illustrations in this book are full of fun details. They really come to life on the page! My Thoughts as a Teacher: After enjoying the fun of a read aloud with this story, it would be useful for discussing a problem and solution story framework. The vivid illustrations also make it a good choice for doing a picture walk through, and talking about the pictures before reading the text. Ethan likes to sleep at night; but his sister, Emma, likes to explore. One night Ethan discovers his monster has left him for someone who needs him more. That someone is Emma. Funny antics follow as Ethan desperately tries to find another monster for Emma so that he can get his own monster back. But Emma is not so easily scared … until she meets Stella. This story is a unique twist on the whole idea of monsters under the bed. It is an exaggerated tale of monsters trying to help children fall asleep. 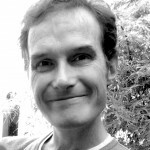 The author uses humor instead of fear to fuel children’s imagination at bedtime. The big and bold illustrations are perfect and make the characters literally pop off the page. The brother and sister duo are cute as buttons and the monsters are not so monster-like at all. If you have monster-loving children between the ages of 4 and 7, they will be sure to love this clever little story. Even children who are a little fearful will learn that maybe monsters are really not that scary at all. Hey, That’s my Monster! is sure to bring “giggles and shivers” to young ones and help make bed time a fun time. When a young boy looks under his bed for his monster, named Gabe, he instead finds a note stating another kid needs him more and he’s “gotta go.” The boy is not at all happy with this new development and is quite certain no-one could need Gabe more than he does. So he sets off in search of his monster. It doesn’t take him long to realize that Gabe has moved next door and is hiding under his baby sister’s bed. He must act quickly if he is to get Gabe back to his own bedroom where he belongs. Hey, That’s My Monster, by Amanda Noll, is a wonderfully creative and entirely fun book that children and adults will love to read. Illustrations by Howard McWilliam are an absolute treasure and further enhance this whimsical children’s picture book. Recommended for home and school libraries, Hey, That’s My Monster, has earned the Literary Classics Seal of Approval. This book has all the same great qualities as I Need My Monster with the added opportunities for pronouns (he, she, his,her). It is also fun to compare the monsters found in both books. I love any book that takes the fear of the dark or fear of monsters and makes it into something fun instead. This book, which I didn’t realize was a sequel, does just that. It gives a reason for monsters being under the bed, and makes it something necessary instead of something scary. And the illustrations and the sibling element make it even more enjoyable. I have already reserved the first book, I Need My Monster, from the library. 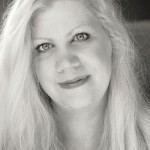 A few weeks ago, I was lucky enough to attend Book Expo America in Chicago. There were many publishers and authors there discussing new books that would be released soon. As I walked among the shiny, slick covers of new and soon-to-be-released titles, I saw the familiar black cover and fonts of I Need My Monster. I felt it was necessary to stop and inform the nice publishing lady how much my child loved the book. But, as I approached the booth, my eyes examined the cover a bit closer. WAIT A MINUTE! There are TWO kids on the cover of this book! I immediately snatched up the galley and began examining the cover mere millimeters from my eyes. Yes, there were in fact two children on the cover…I Need My Monster only had one. Who was this new kid? Where was Gabe? What was going on? Oh My Gosh…is this a new book?!?!?! Fortunately, the nice publishing lady came over and answered my questions as I babbled them incoherently at her (even including the story about my kid dressing up as Gabe). The girl was so excited to see the new monster book, entitled Hey, That’s MY Monster, due to be published on September 1, 2016. The story and illustrations are wonderful and just as entertaining as the first book. I am required to read BOTH books at bedtime now, but they are both so good, that it is easy enough to read them over and over (and over). It’s all in good, sorta-scary fun well-stirred into a bedtime story just right for a pre-Halloween bedtime or story circle story. Artist Howard McWilliam has a blast with his luminously glowing main characters and his uber-creative, sometimes sarcastic, monster characters, done up in a palette that is perfect for the night-time setting, a sleepytime story that is never a snooze, but appropriately ends with not one, but two sleeping kids. Hey, That’s My Monster makes an interesting bedtime tale. Emma is adorable. Her infectious energy, especially with the monsters, keeps anyone from scaring this hyperactive kid to bed. The monsters are most appealing. With their big expressive eyes to their various looks, they steal the story away from poor Ethan. Quite frankly, I did not care if he got Gabe back or not. The real action was in Emma’s reactions to each monster, as she played with their outgrown body parts. Emma’s room is scattered with toys, making the night scene brightly colored with loads of detail. The twist was unexpected and works nicely, giving Ethan and Gabe something in common to keep those two together. The fun bedtime tale, Hey, That’s My Monster is filled with both gross and giggle moments, emphasis on giggle. Young children will love the monsters who try to scare Emma to sleep with their best moves, but Emma won’t be scared. Both children are nice role models for a child fearful of a monster-under-the-bed. If you like I Want My Monster, you will like Hey, That’s My Monster. Great illustrations accompany this monster tale, from cover to cover… And look at the adorable little sister… There’s just the right amount of shiver to hook five year olds right in. We read it fifty seven many times, with “Again!” following every reading. I am always interested when books strike just the right note with the Littles and this one does. 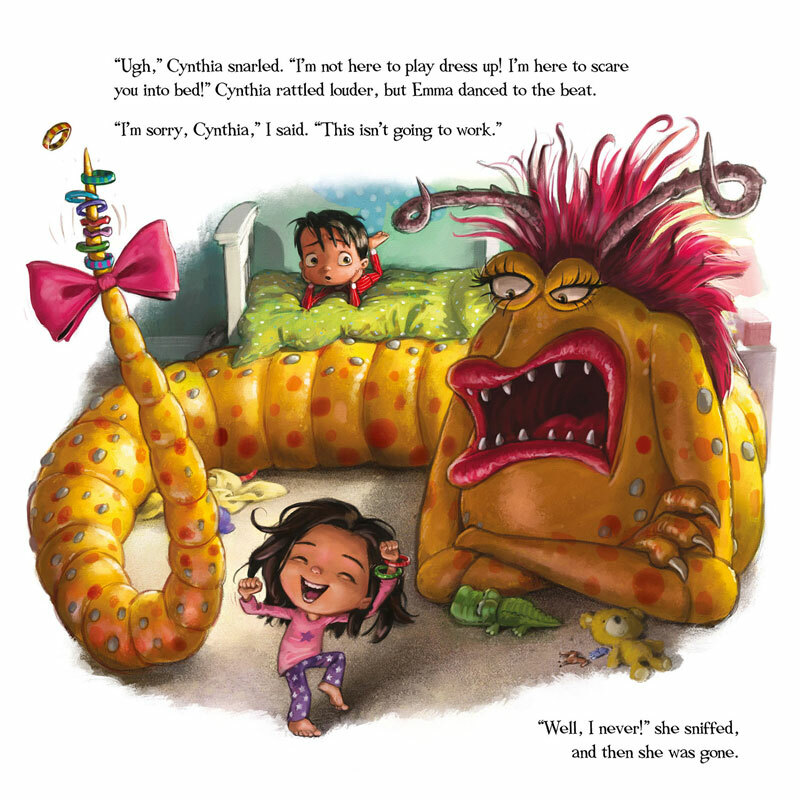 Going to bed in the dark, with monsters or without, is a fear that is pretty much universal, and this story helped the kiddos deal with that fear in a lighthearted way…. I highly recommend both I Need My Monster and the new Hey, That’s MY Monster. …Flashlight Press for sending me the review copy. I can honestly say it is adored by my monster loving kidpeople AND their monster loving teacher, too!! … a consistently high quality publisher and every teacher should know about them. For all the monster lovers, this is a charming tale children will love. This silly, spooky story introduces the reader to Emma, Ethan’s sister who needs her very own monster. Gabe, Ethan’s monster quickly comes to the bedtime rescue, but Ethan does not want to share his monster. Ethan knows Emma needs a monster to get to sleep too as long as it’s not his monster. Ethan will do anything to get Gabe back; he even tries to get Emma to fall sleep on his own. After countless tries, Gabe is unsuccessful. He then shows his sister how to ask for her very own monster. One by one monsters appear but none of them can get Emma to sleep. When they think all hope is lost, one last monster arrives. Will Emma finally be able to go to sleep after finding Stella under her bed or will Ethan lose Gabe? This fun, exciting bedtime story will have children loving monsters in no time. The bright, vivid illustrations bring a movie like quality to the pages and really bring the text to life. Young readers and adults alike will be looking for the next monster in this unique collection. This is the sequel to Noll’s endearing I Need My Monster (Flashlight Press, 2009). Ages 3 to 7. This is another very well written and incredibly well illustrated picture book. McWilliam’s cinematic artwork is brilliant. This is a great monster-under-the-bed book for all monster-loving children. Children who have read the earlier book by Noll and McWilliam will thrill in the new adventure of this second book. Do you look under your bed for a monster? Does that monster have a name? Ethan has his own private, personal monster named Gabe. That is, until Gabe decides that someone needs him more than Ethan does. Ethan’s little sister, Emma, is in desperate need of a monster so that she can get to bed and sleep each night. If Emma now has Gabe, what is Ethan going to do? He’s got to take action and Gabe gives him the opportunity. He’s got three chances to find just the right monster for Emma or it is so long to Gabe on a permanent basis. However, it is tough to find just the right monster for a boisterous and not terribly sleepy little girl. Perhaps Gabe is just the right monster for her. Or is he? Check out even more activities at Storyline Online! Error: Error validating access token: Session has expired on Sunday, 23-Sep-18 01:36:16 PDT. The current time is Friday, 26-Apr-19 01:08:24 PDT.